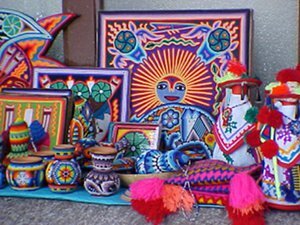 Huichol art is the art created by the Wixarica Indigenous community or Huichol Indians descendants of the Aztecs who live mainly in small villages in the mountains of the Mexican states of Jalisco and Nayarit. They possess a very rich culture. The art and crafts from the Huichol people are well known and appreciated all over the world because of its colorful and psychedelic designs inspired by visions under the influence of the peyote plant which is fundamental for their ceremonies and rituals. Also their work reflects a strong relationship with nature. Huichol people are in constant transition due to the pressure of modern civilization, although they strive to preserve their traditional way. Because the community struggles with poverty, many of them have immigrated to big cities such as Guadalajara and Tepic trying to earn a way of living. They sell their handcrafted products as a way of survival. Huichol art characterizes for being very symbolic preserving the ancient beliefs and ritual ceremonies. 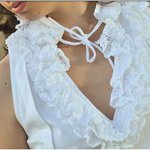 Among the most popular items, they make beautiful elaborated yarn paintings, and colorful embroidery clothing with meaningful shapes and designs and detailed bead figures. For the Huichol people their art is important because it is a way to preserve and encode their spiritual knowledge. They use their artwork to participate in rituals and religious ceremonies, and they use them to express their deepest religious beliefs acquired from their ancestors. Their artwork is very diverse, from the small bead figures of eggs to animal figures such as jaguar heads to detailed yarn painting (Nierilas). When talking about the Huichol art, we need to stand out the importance of the "Nierikas" which is a board with applied tree resin and beeswax where threads of yarn are pressed creating beautiful and colorful paintings. They are usually the result of personal experiences and their interpretation of ancient stories. These items are used by the Huichol people to communicate with the spiritual world and to connect to nature and all living things. The Nierika, for ritual uses could be face of the sun, a deer, the wind, the peyote plant or even the face of the man making the offering. Because Huichols are taught to be spiritual people as children, they communicate with spirits through different kinds of symbols and rituals. For them, the work with yarn painting is an artistic expression, and they reflect their culture and traditions on each stitch. Another type of art is the bead work; they made beautiful beaded bowls and detailed animal figures full of colors and originals designs. In the past they use to color their figures with insects or vegetable dyes. These art pieces where originally made as offerings to the gods and goddesses. They believe that the gods drink up their petitions from the bowls and listen to them. Nowadays there are other forms of Mexican art expression based on the Huichol original designs, such as Mexican paper jewelry and stampped textiles. The peyote plant is also very important for their art work; it is venerated by the Huichol because it represents a gift from the gods, and because through it, they feel inspired to create their designs. It symbolizes their essence and is believed by the Huichol people to give good fortune. Today we understand much more about the Huichol culture, their outstanding art work and their strong relationship with the spirits and nature. Because the Huichol art and paintings are very much appreciated, some artists are invited to attend exhibitions in large cities such as Guadalajara or Mexico city.